Ever since before Thanksgiving, I've been kind of in a cooking slump. My excuses were closing on a condo, packing, moving, visiting my family in Seattle, coming back, unpacking, getting settled, etc. Really, I could go on with these excuses for ever. But I need to remember how satisfying it is to make a simple meal in my kitchen and not to be eating out every single night. 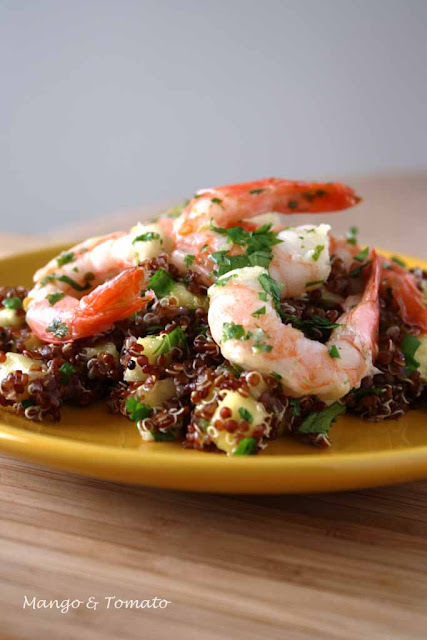 Over the weekend I was inspired by a recipe Anna developed for Fitness Magazine and decided to make Red Quinoa with Pineapple and Shrimp. 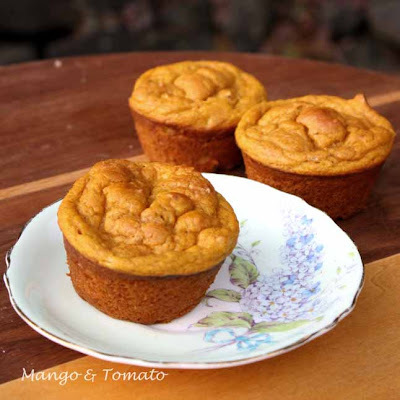 The flavors in this recipe are bright, sweet and spicy. 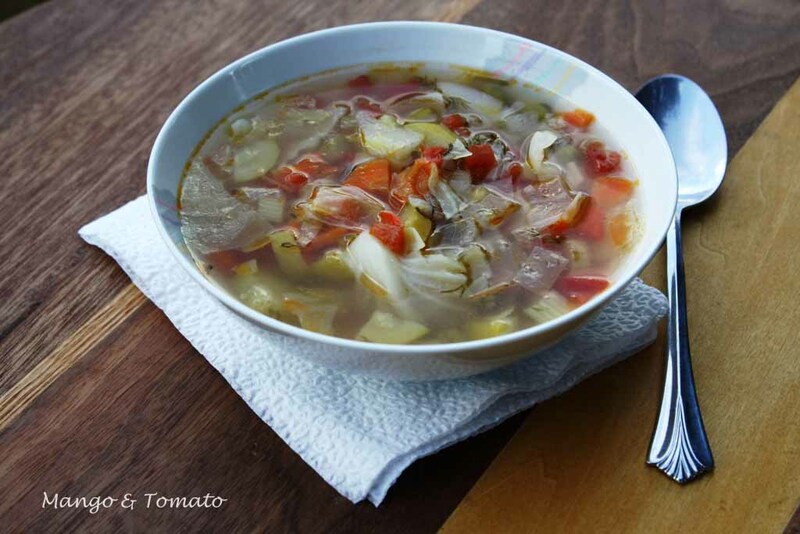 They definitely will wake up your taste buds during the cold days of winter, but the dish can be made year round. 1. Combine all ingredients for the shrimp and marinade for 20 minutes. 2. 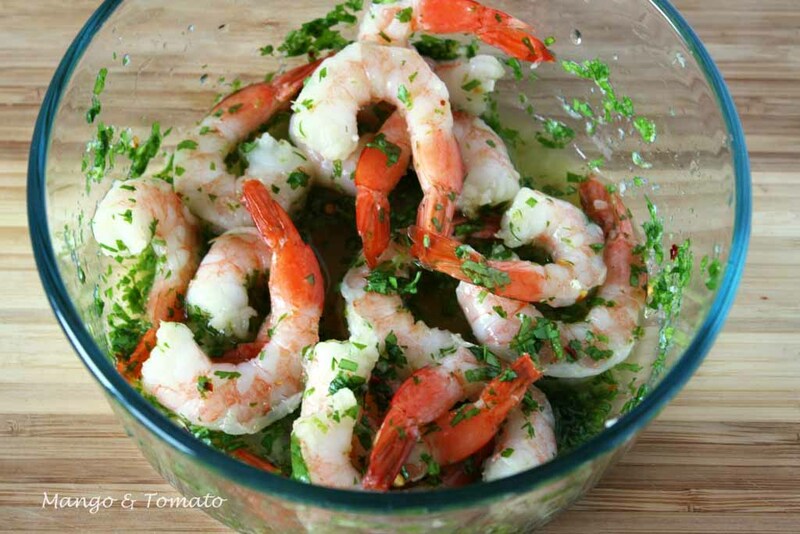 Cook shrimp in a bit of olive oil until it's warmed through: do not overcook. 2. Meanwhile, bring salted water to a boil, add quinoa and cook for about 15 minutes. 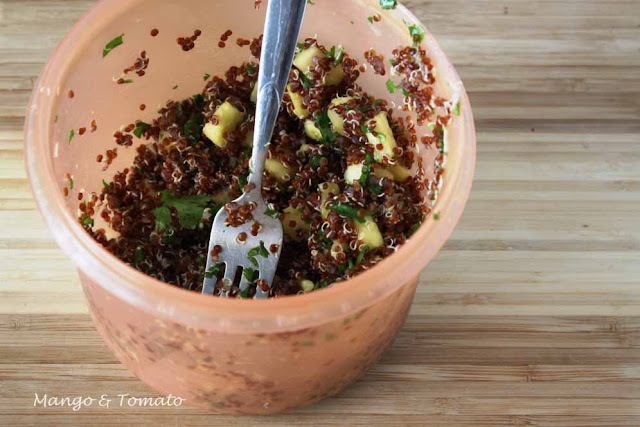 I also added pineapple core to the water to give a slightly sweet flavor to the quinoa. Drain the quinoa and get rid off the pineapple core. Add chopped pineapple and cilantro. Check for seasoning and drizzle with olive oil. 3. 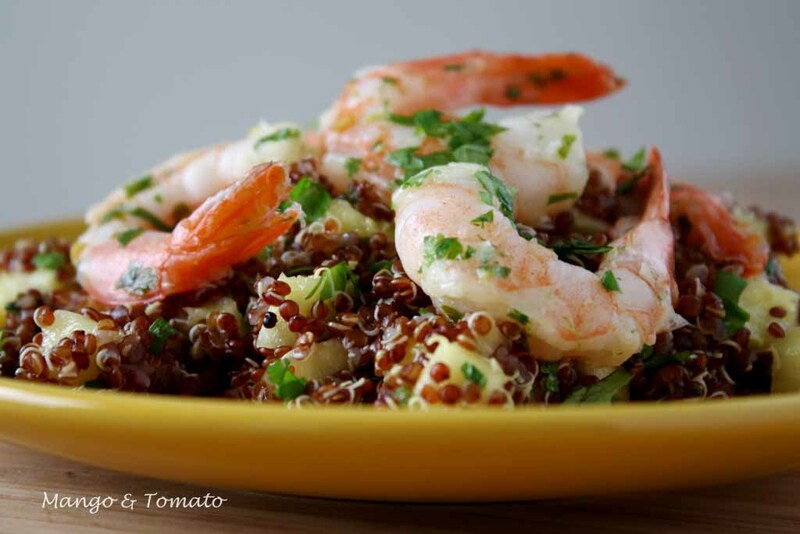 Serve shrimp on top of the quinoa. Enjoy! This dish is great served hot, at room temperature or even cold. The flavors play together nicely and become more pronounced on the second day: great leftovers! Please share the dishes that help you get out of the cooking slump. And if I don't talk with you soon, have a wonderful New Year celebration. I wish you happiness, health, fun adventures, supportive family and friends and of course a lot of good food. 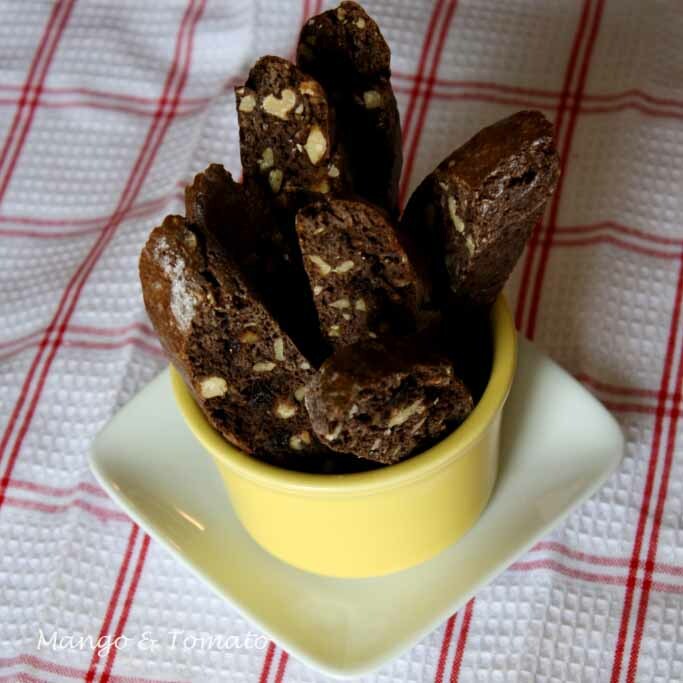 I've made biscotti multiple times before using a variation of Robyn Webb's recipe. One of my favorites was Crystallized ginger & pistachio biscotti. 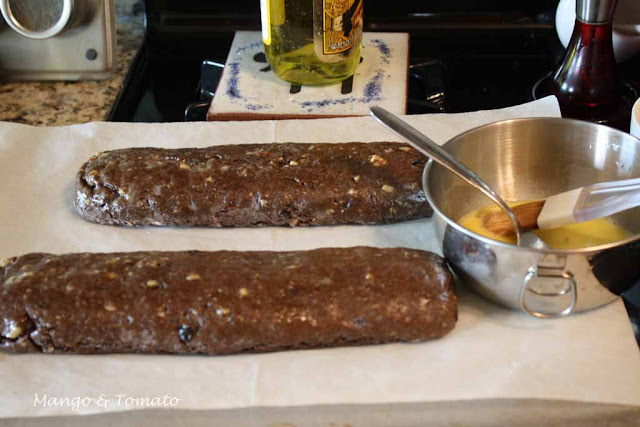 Over the past few months I've been meaning to bake a batch of biscotti and finally made plans with Jenna to do so last Friday. This was the first time I baked something in my new oven! 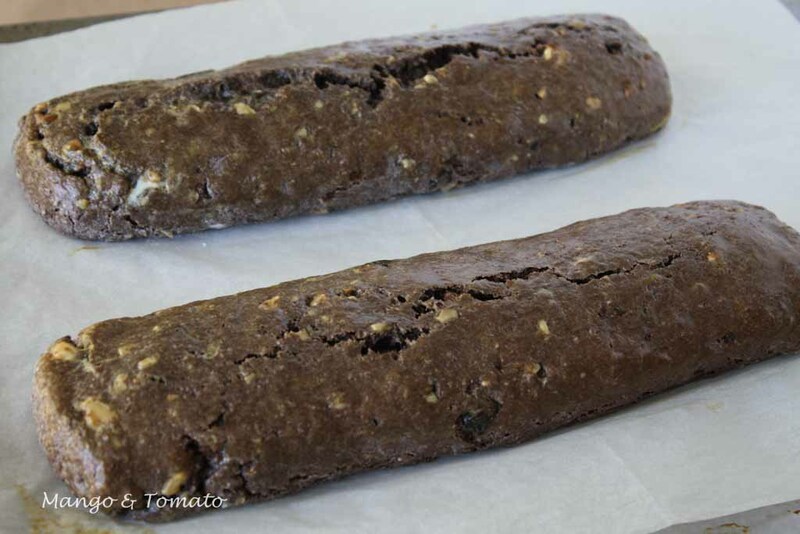 I decided on chocolate biscotti with walnuts, bought the ingredients and asked Jenna to bring a cookie sheet and her baking expertise. 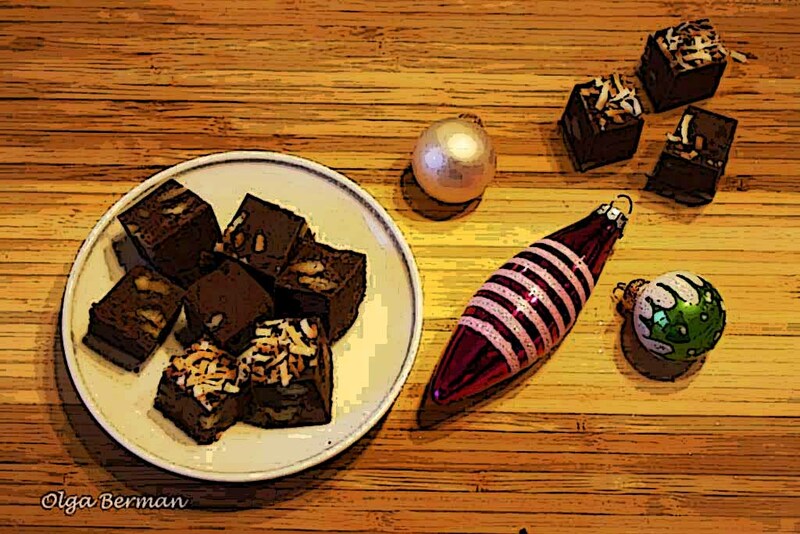 We had a great time playing in my kitchen, catching up and inhaling the chocolate fumes from the cocoa. 2. 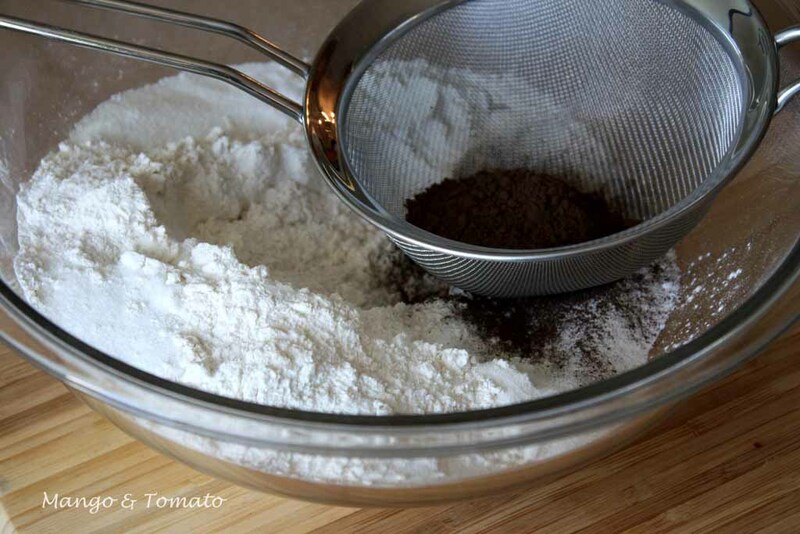 In a bowl combine flour, sugar, baking powder. Sift in cocoa powder. 2. Add walnuts and dried cherries to the mixture of dried ingredients. 3. 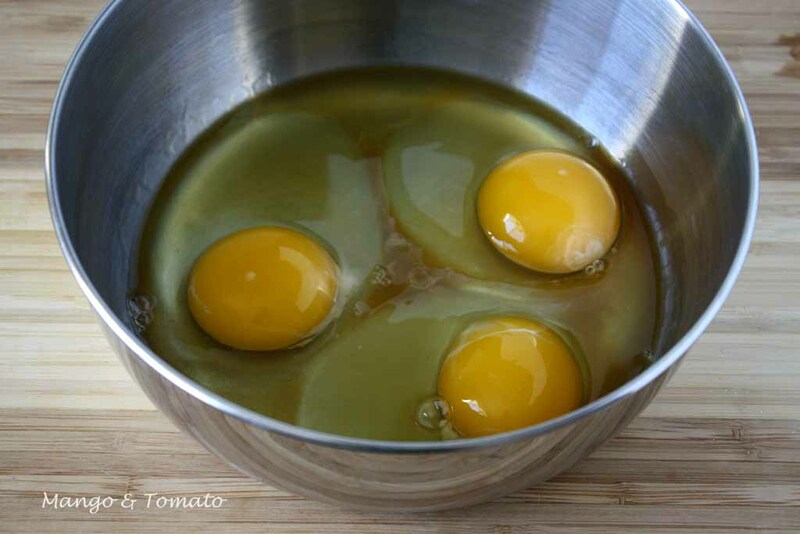 In a separate bowl combine eggs and vanilla. 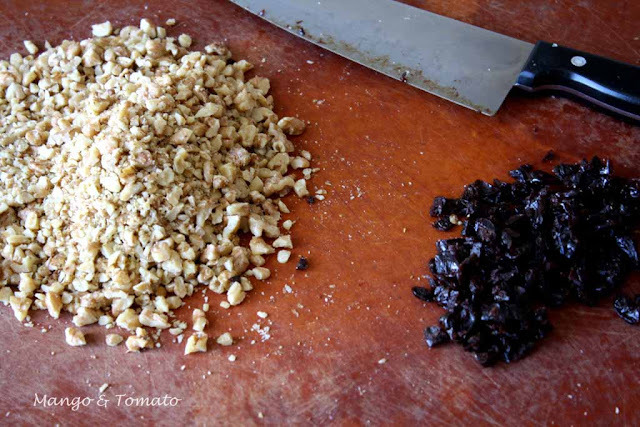 Incorporate into the dried ingredients mixture. 4. 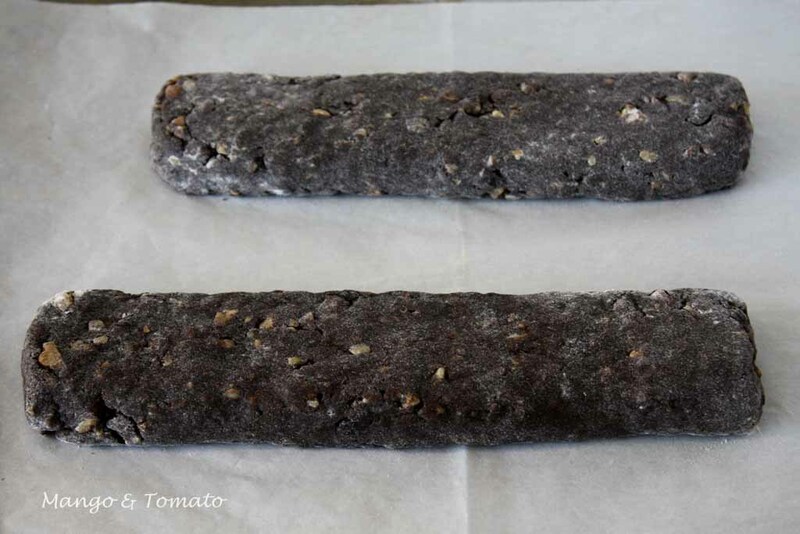 Form the dough into two logs on top of a parchment paper lined cookie sheet. Flatten the logs and bake for about 25-30 minutes. 6. Once the logs are firm to the touch, take them out of the oven and let them cool. 7. Cut the logs diagonally into slices about 1/3rd of an inch thick and bake them again for 15-25 minutes until they are well toasted. Jenna and I hiked up the oven temperature to 375 in the last 10 minutes and also turned the biscotti over half way through the baking process. 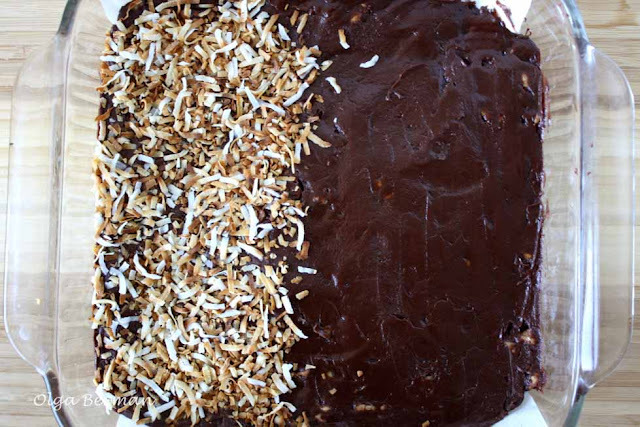 Thoughts: This was a super easy baking project. Since the dried cherries were an afterthought, I only used what I had on hand: 1/4 cup. I'd definitely increase that amount to 1/2 cup and also add more sugar to the recipe. Jenna suggested adding some fat, which I think is a great idea. 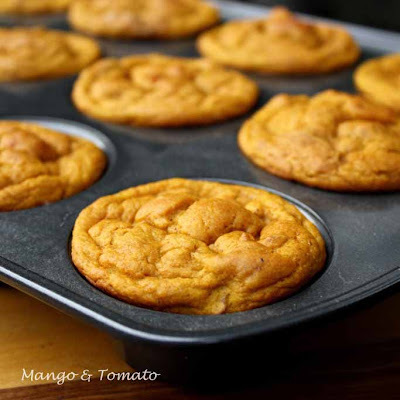 Do you have any suggestions for improving this recipe? Please share in the comment area. 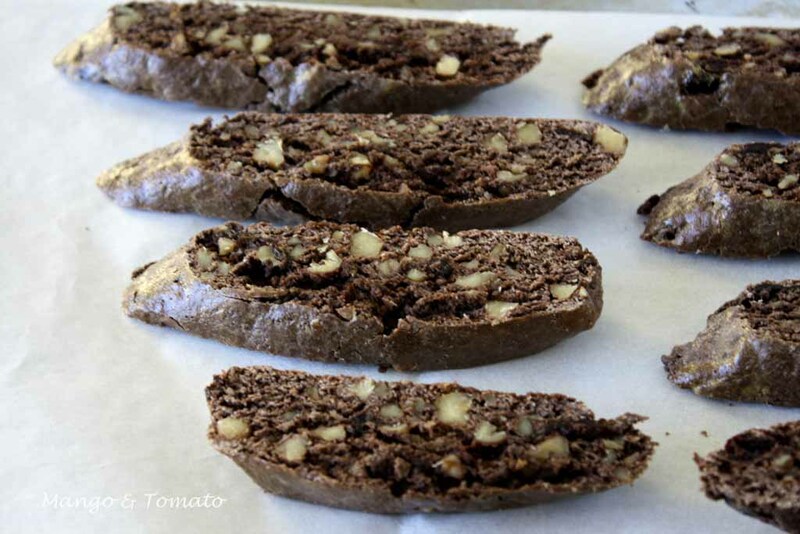 Also, let me know what you like to add to your biscotti. If you are celebrating Christmas, I hope you are having a joyous time with your family and friends, great food and that Santa has been good to you. Below are two special ornaments I received for my tree this year: the first one is from my friend Jenny, the second one is from my friend Mary. And the last photos is of my gorgeous amaryllis that was only $9.99 from Ikea. 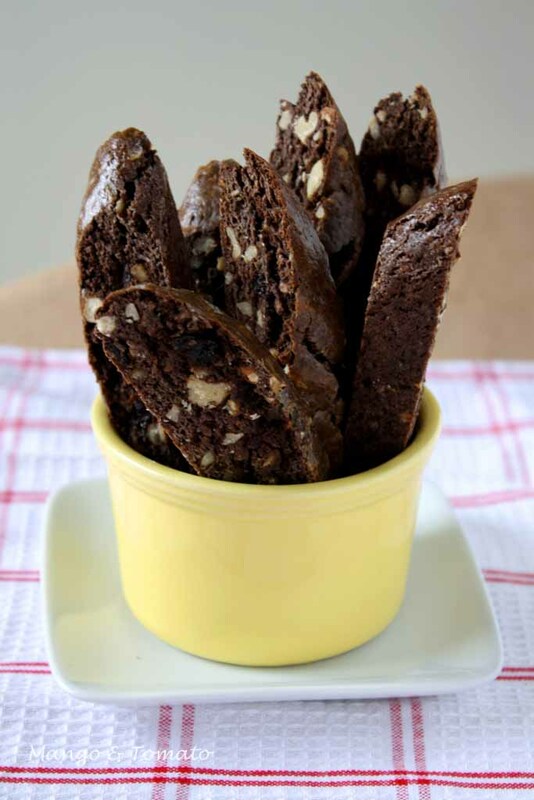 Come back on Monday for a chocolate/walnut/cherry biscotti recipe I made with Jenna. Fudge! 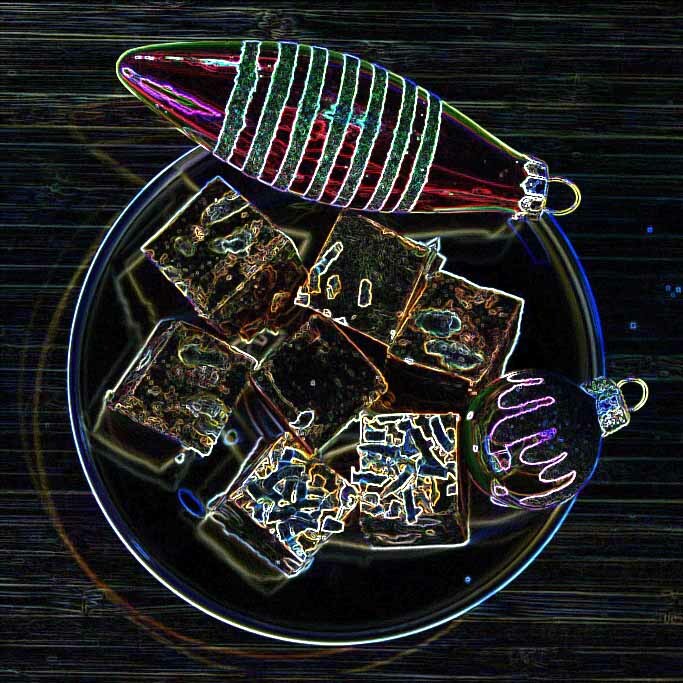 Did you forget to make something sweet for the holidays? 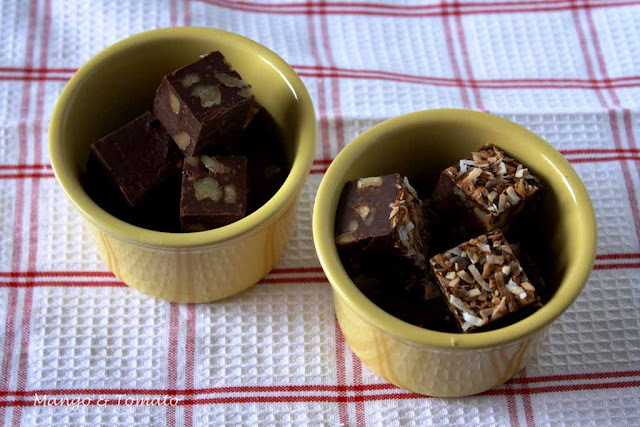 Then you should definitely read this post and make this easy no-bake sweet treat to share with your friends! The truth is that I stumbled upon a fudge recipe on Sasha's For The Love of Food blog, and it looked sinfully delicious and ridiculously easy: a perfect combination if you ask me. She adapted her recipe from Anne Thornton's on Food Network, and I further made a few changes. 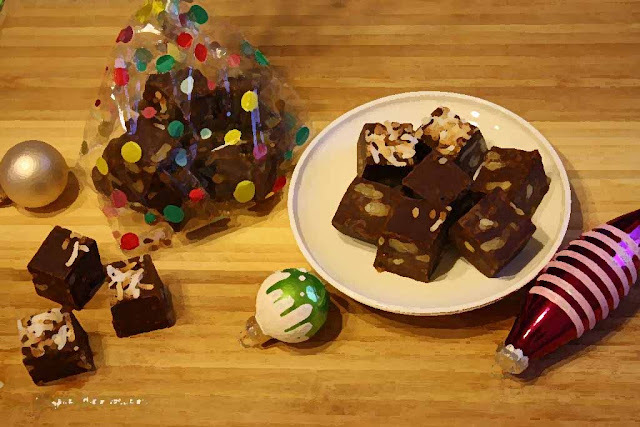 This was the first time I've made fudge and I was happily surprised by the results. 2. 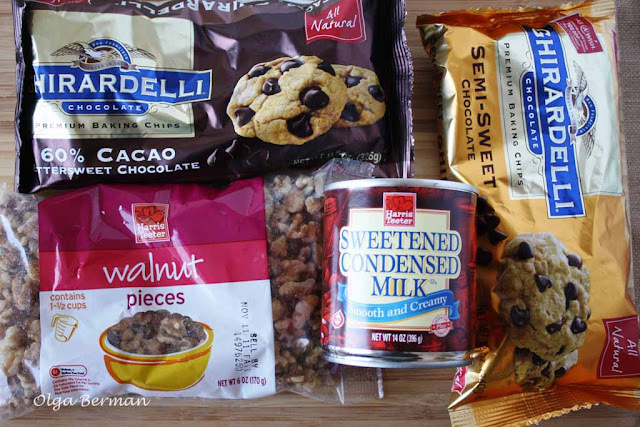 Add vanilla and walnuts and mix. 4. Refrigerate for at least few hours. 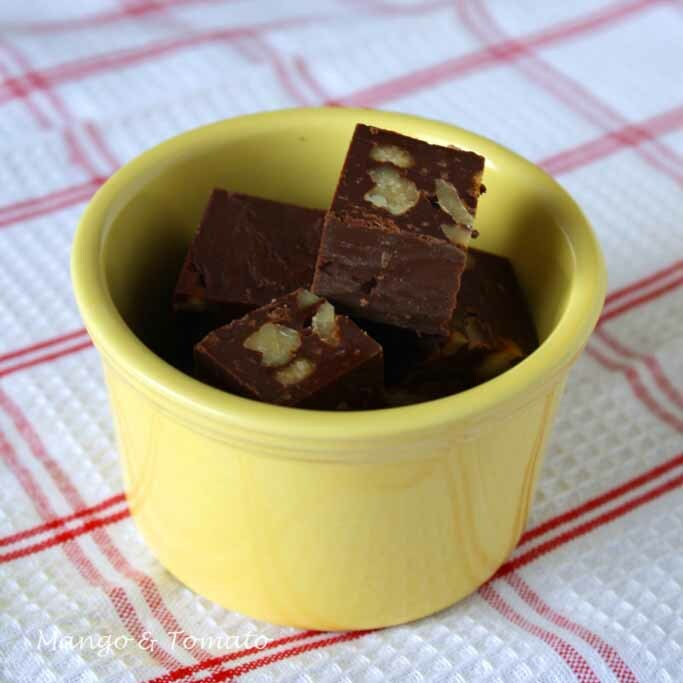 Remove the fudge from the 9x9 container, peel back the parchment paper and cut into small pieces. 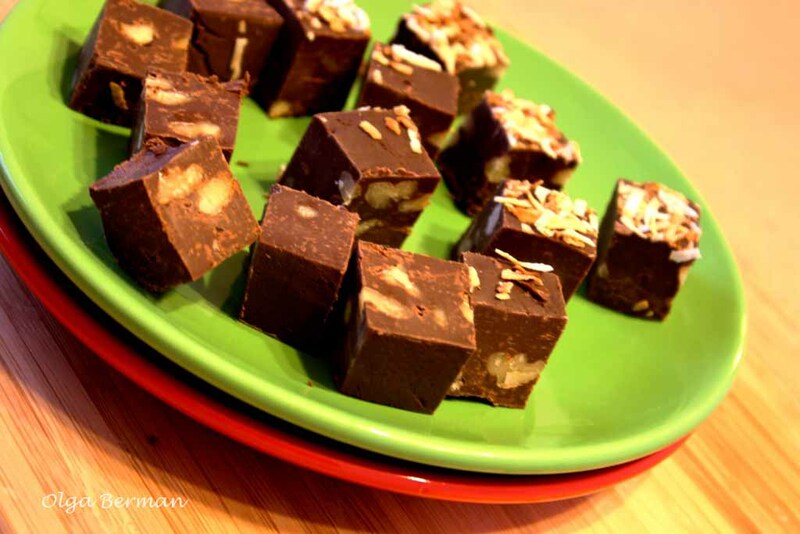 Give the fudge to your friends or let it sit in your fridge and enjoy a small piece daily. Are you a fudge purist or do you like adding things to it? Please share your answer! For those of you who celebrate Christmas, have a fantastic time with your family and friends. 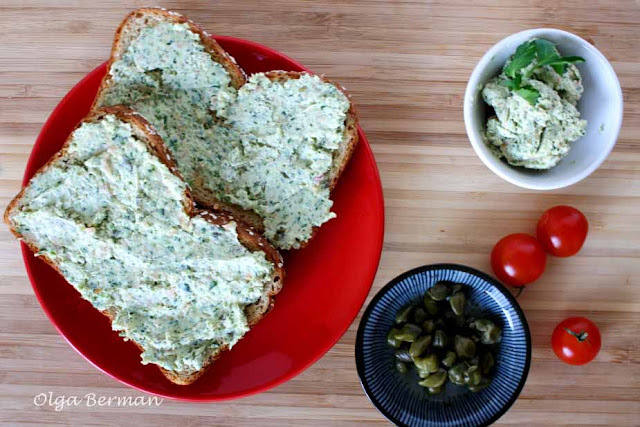 How to make salmon cream cheese at home: easy! Sometimes I come up with little ideas that pack a lot of flavor. Last week I bought a pack of cream cheese and a small container of smoked salmon to bring to work for breakfast. But during one of the commercial breaks for one of the many Bravo shows I watch, I decided to simplify my life and make salmon cream cheese so that I'd just have to bring one thing to work instead of multiple containers. 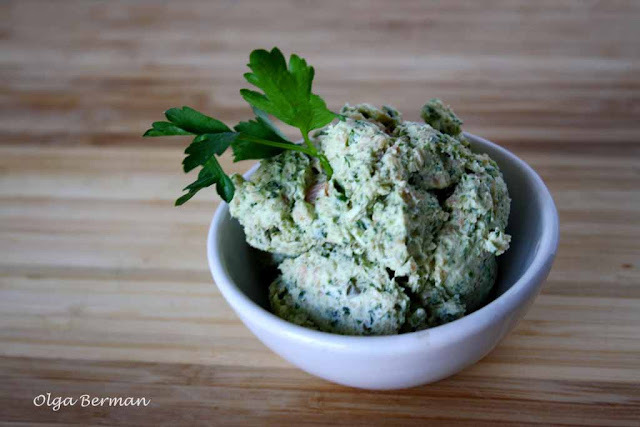 Making salmon (or other flavored) cream cheese at home is incredibly easy. The amounts of each ingredient are just suggestions. You can add less or more as you like. Yes, that's all you have to do! See, I told you it'd be easy. In fact, I wasn't even planning on blogging about this "recipe" because of how simple it is, but when I tweeted about it, some of my followers wanted more details: I aim to please. Spread the salmon cream cheese on bagels or toast and eat as is or top with sliced tomatoes and avocados. 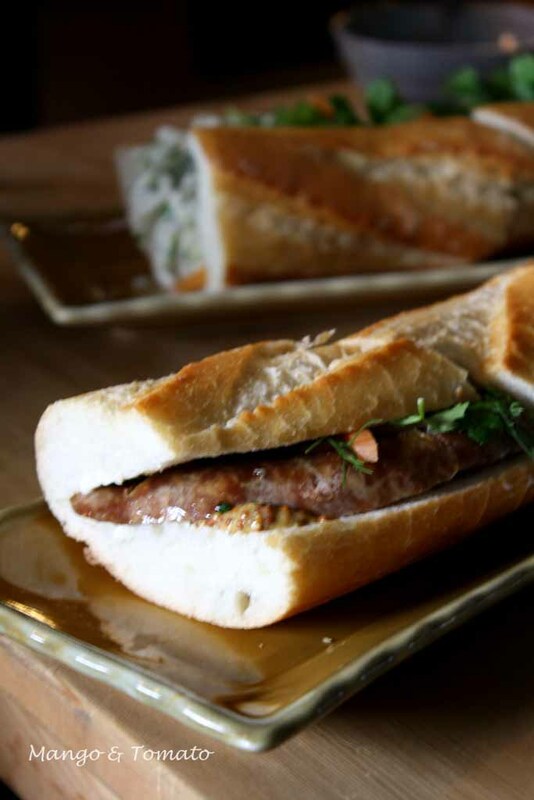 If you are someone who loves all things salty, add a few whole capers on top. 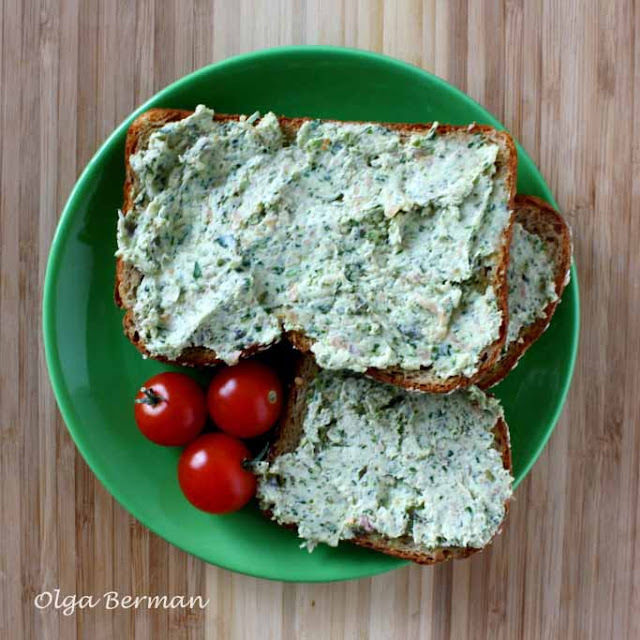 Have you made a flavored cream cheese at home? What was your flavor combination? Needless to say, there have been quite a few meals out to fill in the gaps. 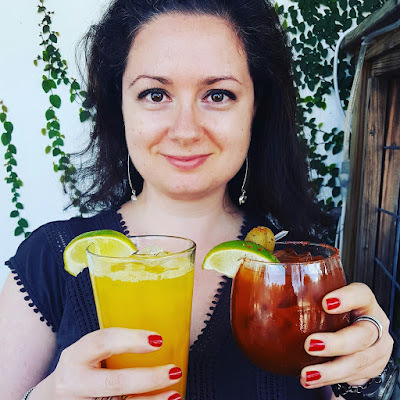 This week I had lunch with K at the recently opened Merzi. 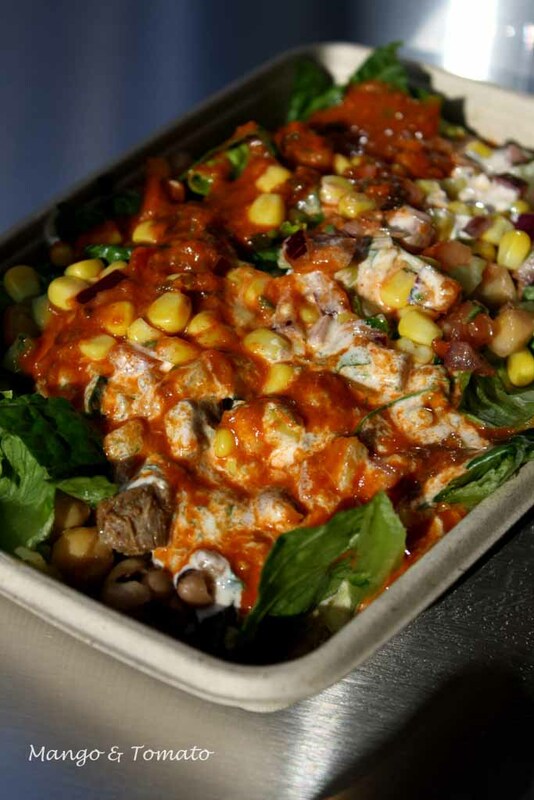 The basic idea of this casual restaurant is similar to Chipotle, which I love, but with Indian flavors. I had high hopes: Chipotle + Indian = success, right? It was one of those cold DC days with strong wind gusts. Unfortunately, K and I weren't the only ones who decided to check out Merzi: the line was out of the door! Luckily, it moved quickly and we were inside in less than 10 minutes. 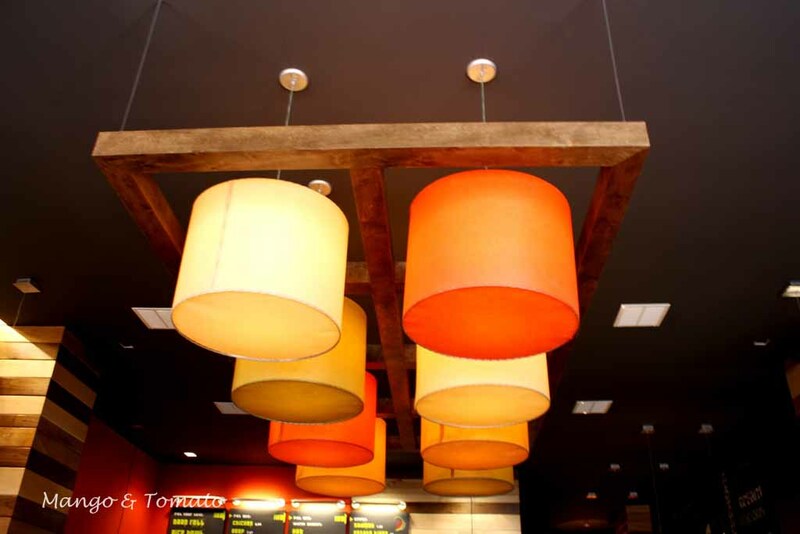 I loved the decor: modern and warm with bright colors. Aren't the lamps gorgeous? 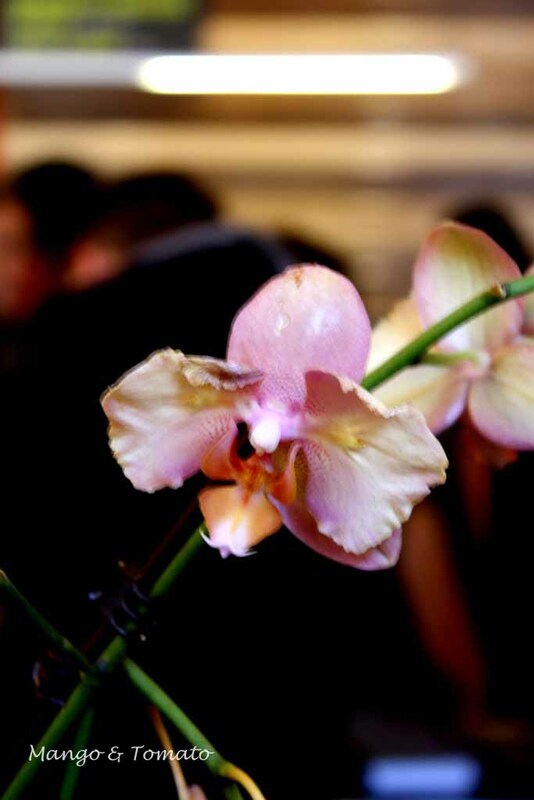 While standing in line we got to taste naan and a few chutneys, and I could not resist taking a photo of this pretty orchid on one of the tables. 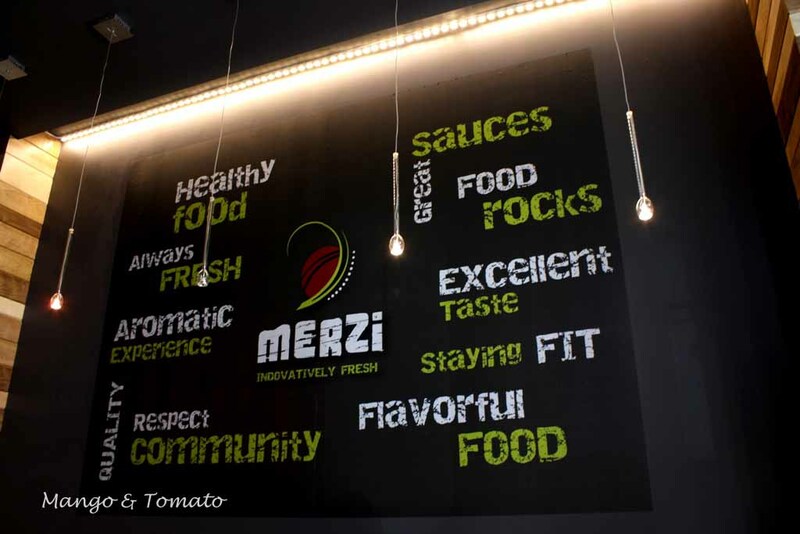 When you walk into Merzi, you will be surrounded by delicious aromas–try to focus on the meal you are about to order for yourself! Walk to the counter and get ready to order. 1. Pick one of the following for the base for your meal: naan, rice, salad or chaat. 2. Pick one of the following: Black-eyed peas, garbanzo beans, or onion-pepper mix. 3. Choose your meat (or not!). 4. Pick whichever fresh vegetables you like. 5. Choose one of our warm sauces or cool chutneys to throw on top of it all. 6. Choose a drink and ask for a samosa or potato tikka at the register. 7. Grab a fork (or just grab your naan roll) and enjoy! Whenever lamb is on the menu, that's usually my first choice. I did not deviate from my normal routine. I chose chaat, a combination of black-eyed peas, garbanzo beans, onions and peppers; corn and tomato salad and medium chutney. K went with rice and chicken. The food was good and filling and fresh. This is definitely a great place to come for a quick lunch or dinner, but I was hoping for more Indian influence. Next time I'll have to try their naan and braised shredded beef. I've also finally made my way to the newly reopened Ardeo & Bardeo. This was a media event and I got to taste five different passed hors d'oeuvre. Some were better than others. For example, the beet salad and the garbanzo bean salad were good, but nothing I could not have easily made at home. 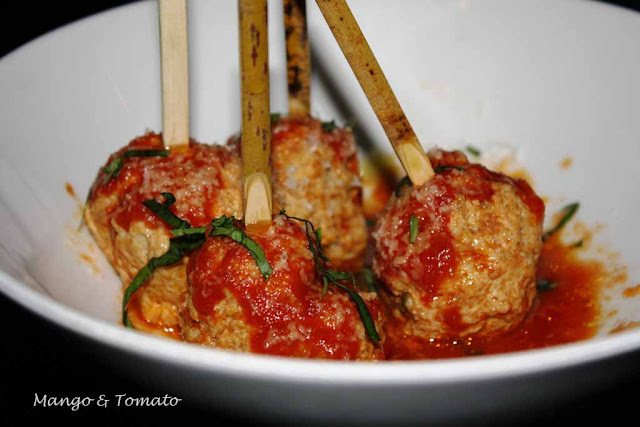 My favorite dish by far was the veal and ricotta meatballs with citrus scented tomato sauce. These would have been so good over cheesy polenta. My favorite meal by far, however, was dinner at Estadio with my friend Wendy. I can't believe this was the first time I was eating at this Spanish restaurant. ﻿(Sorry, I left my camera at home, so no photographs) We sat at the bar right by the open kitchen and enjoyed seeing how the dishes are made. Everything we tried was spot on, and I'm not even exaggerating. This meal brought so many fond memories of my trip to Madrid last Spring. I definitely need to come back to Estadio and check out their seafood dishes. Where have you had good meals lately? I'd like to share with you my first real meal cooked in the new condo: Kale and White Bean Soup with Turkey. 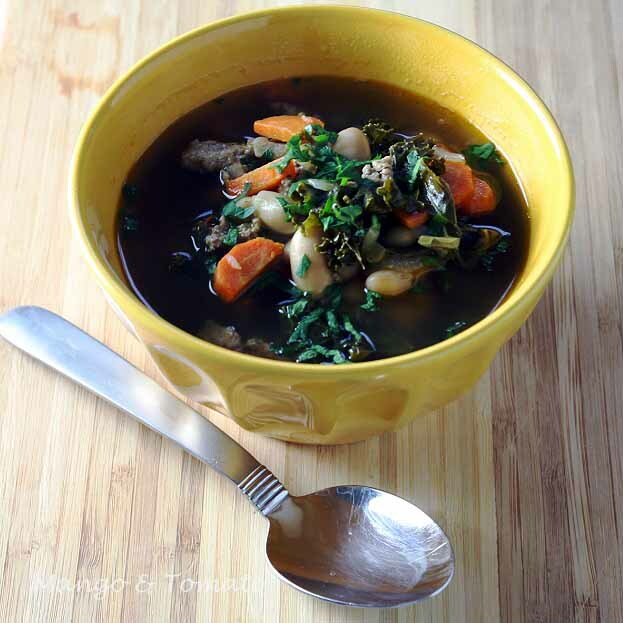 This soup is ridiculously simple to make, gets better with time, is really healthy and can be made vegetarian by eliminating ground turkey from the ingredient list. The sweetness of the carrots is a nice contrast to the heat from the chiles in adobo sauce. Oh, and this was also the first time I tried out my brand new Ego light. I definitely need more practice. 1. Saute onion, carrots and garlic in olive oil till translucent. 2. Add ground turkey, salt and pepper and chile peppers and cook till the turkey is no longer pink. 3. Add kale and cook till it has wilted. 4. Add beans and all of the liquid. Bring to a boil, lower the heat, cover and cook for 30 minutes. 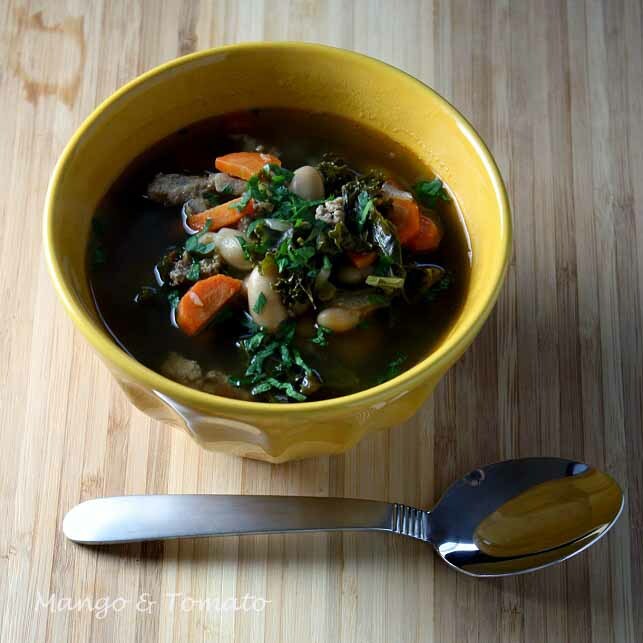 I've been eating this soup for about a week and am still not sick of it. It is really a great way to warm up during this season. 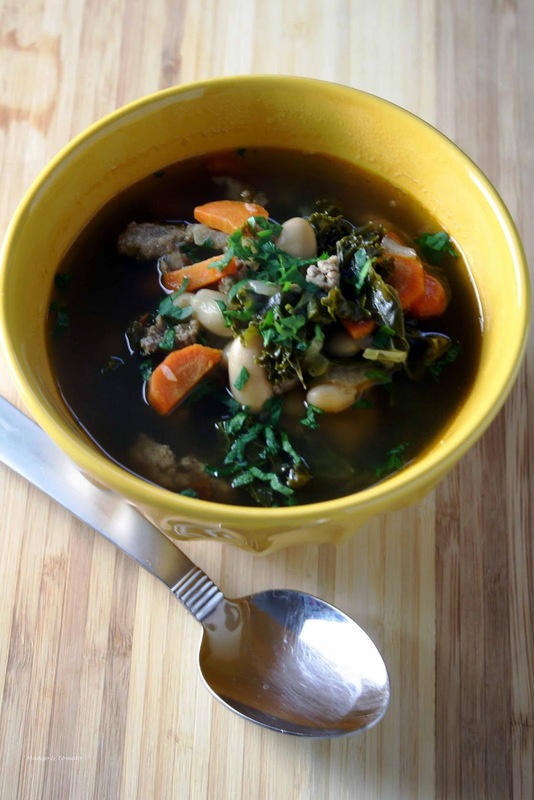 What's your favorite hearty one pot soup? 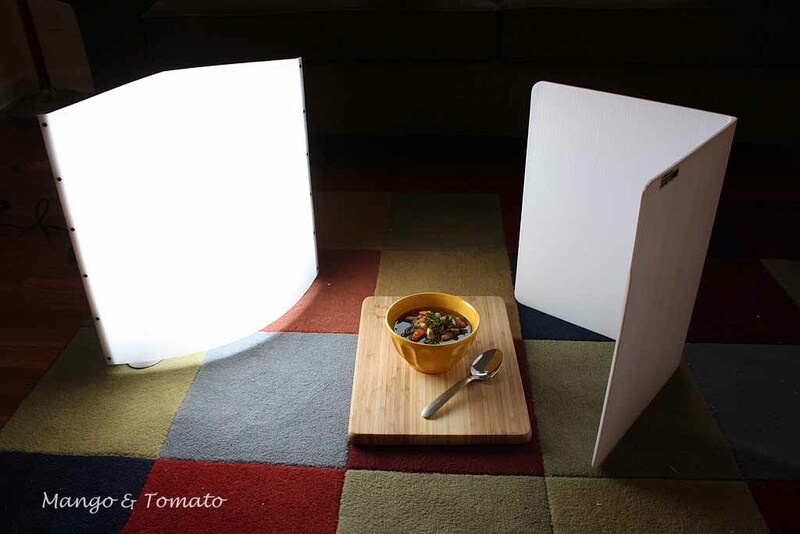 I've done freelance cooking and photography for Robyn Webb's blog for almost a year now. Time flies! When Robyn told me she's working on a few recipes for Nestle Kitchens and asked me to bake a few desserts and take photos, I was at first a bit hesitant. First, I was moving. Second, I was flying to Seattle to spend time with my family. Third, would Nestle's readers know that the photos were done by me? Luckily, all of the issues were resolved favorably, and I flew to Seattle with printed out recipes and a 9 inch spring form pan packed in my suitcase. I was ready to bake Pumpkin Pecan Muffins and Pumpkin Cheesecake with Gingersnap Crust. Let me start by saying that I'm not a huge fan of pumpkin or fall-baked-goods spices such as cinnamon, nutmeg, etc. 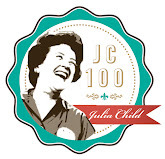 But that's the beauty of doing these freelance projects: I don't have to always like the food. I get $$ for groceries and the time it takes me to bake, photograph and edit the photos, and end up with something new to try. Because Seattle was rather gray and my parents' renovated kitchen has a lot of dark tones in it, I had to take all the photos outside. In the cold. While trying to chase my parents' cat, Gypsy, out of the way so that her tail would not end up in one of the shots. I also had to compromise when it came to listening to music. When I cook/bake in my kitchen, I always have salsa/merengue/bachata music blaring. This time around, however, my dad was home and he's not a fan of Latin music to say the least! Trying to be a good daughter, I decided to listen to my old favorite Russian pop music: it was rather hilarious and brought back many good memories. But back to baking. The recipes were simple enough to prepare, but I really wish someone would have cleaned up after me. Isn't that the worst part of cooking? I had one of the muffins and shared the rest with my grandparents. Everyone liked it just fine. I must confess, however, to using real sugar instead of Splenda. 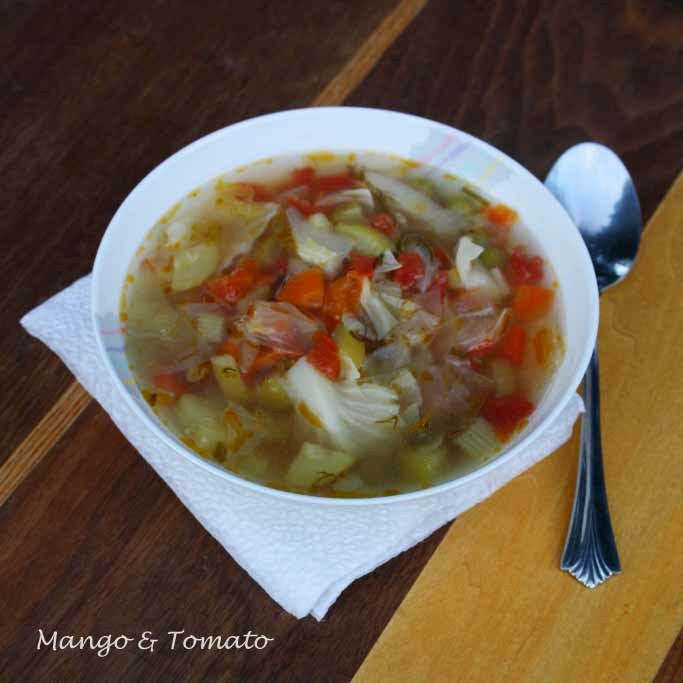 After all, I wasn't testing the recipes: I was simply making them to take photos. The recipes were already tested by Robyn and a few other people. The cheesecake was interesting. 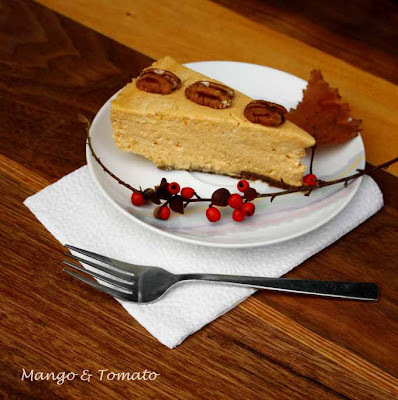 Because it used cottage cheese, it did not have as smooth of a consistency as regular cheesecakes, but it definitely was a lot healthier than the ones made with just cream cheese. I did like the gingersnap crust and the color of the cheese cake was really pretty. For full recipes, check out this post on Nestle Kitchens. I look forward to more freelancing with Robyn, Nestle and many others! Food + Photography is a win/win! One of the things I like about visiting my family in Seattle is checking out new restaurants and meeting my twin's friends. While in Seattle for Thanksgiving, my dad's 60th birthday and Hanukkah (can you say a triple threat!? ), I just happened to do both: try out a new restaurant and meet Anna's friend Valentina. 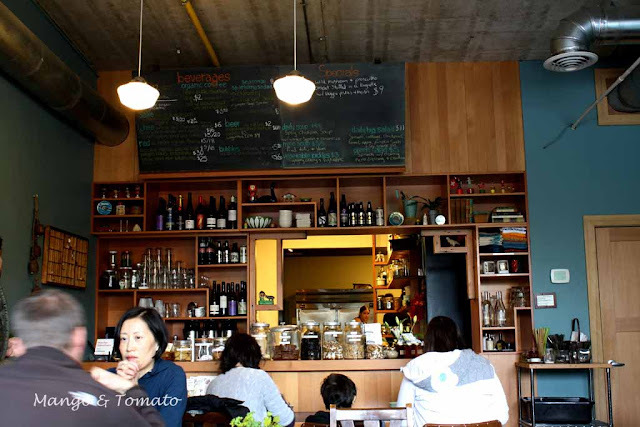 When Anna and I drove up to Nettletown, located in the heart of Seattle's Eastlake area, I must admit I had my reservations. It was right next to Subway, which I love on occasion, and looked rather commonplace from the outside. Anna reassured me that Valentina has raved about this little cafe and has eaten there many times. I decided to step in. Once inside Nettletown, my opinion changed completely. I loved the low key decor, the open kitchen, black board with the menu on it, and overall a feeling of stepping into some one's house. And all this before I even looked at the menu. All three of us decided on a cup of chickpea soup with butternut squash and tomatoes and a sandwich. The lighting in the restaurant wasn't the best for photos, but I tried nonetheless. First, let me tell you that the soup was perfect for Seattle's cold and windy weather. Both Anna and I were surprised that the soup wasn't pureed, but there was nothing wrong with chunks of butternut squash, plump chickpeas and other vegetables in the flavorful broth. Eating the soup, I decided that the first meal I'll make in my new kitchen (I bought a condo and moved right before Thanksgiving!!!) will be a pot of soup. 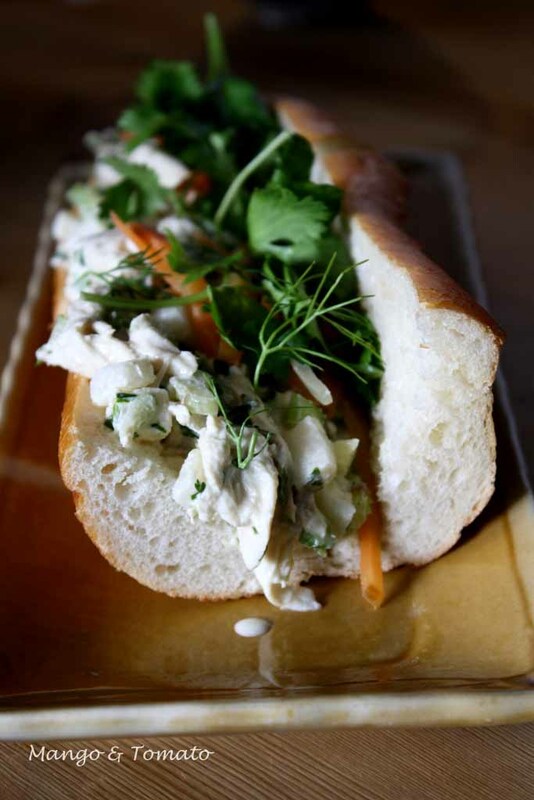 Valentina's sandwich, pictured below, was chicken salad: creamy organic chicken salad with celery, lemon and jicama. I decided to try out a bratwurst sandwich: rain shadow meats bratwurst with caramelized onions and mustard. I'm usually not a fan of mustard, but the whole grain mustard on my sandwich stole my heart and my stomach. The bratwursts were juicy and grilled, and I really liked the bah minh-like marinated carrots inside of the sandwich. The bread was fresh and not overly crisp; I really dislike when the bread is so crisp that it's hard to take a bite of your sandwich. 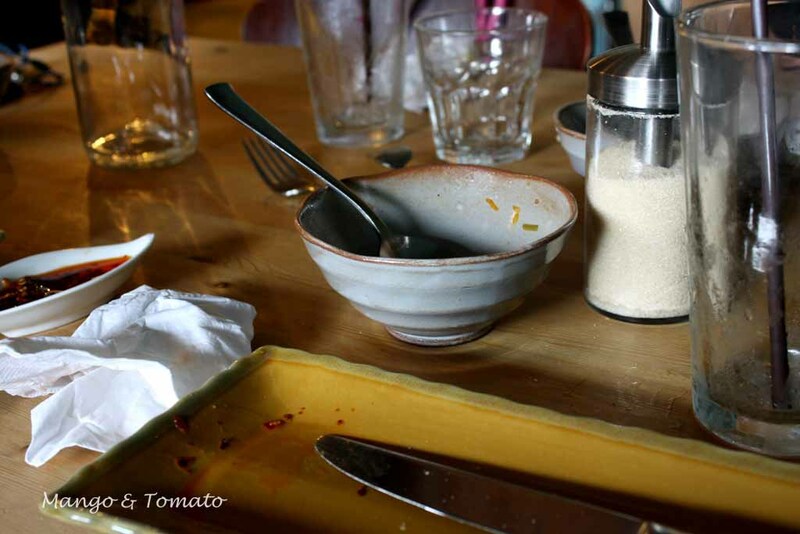 Check out the photo below: needless to say, we really enjoyed our lunch at Nettletown. It was a very low key way to spend a weekday lunch and I loved meeting the talented and worldly Valentina. After our soups and sandwiches, we headed out across the street for cafe lattes and shared a dessert: thanks Valentina for a lovely treat. If you are ever in Seattle, definitely check out Nettletown. I really should learn not to judge a book by its cover.